The Trans-Pacific Partnership is the most comprehensive trade agreement in the world. The TPP will help deepen Canada’s trade ties in the dynamic and fast-growing Asia-Pacific region while strengthening our existing economic partnerships with our partners in the North America Free Trade Agreement and across the Americas. It currently comprises 12 countries (Australia, Brunei, Canada, Chile, Japan, Malaysia, Mexico, New Zealand, Peru, Singapore, the United States and Vietnam), representing a combined market of nearly 800 million people and a gross domestic product (GDP) of $28.5 trillion. With the TPP, Canada has now concluded free trade agreements with 51 nations, ensuring Canadian businesses have access to over 60 percent of the world’s economy. The TPP and trade agreements with the European Union and South Korea make Canada the only G-7 nation with free trade access to the United States and the Americas, Europe, and the Asia-Pacific region. In 2014, Canada’s forestry sector contributed close to $24.9 billion to Canada’s GDP and employed nearly 237,000 Canadians, most of them in jobs that tend to be highly skilled. 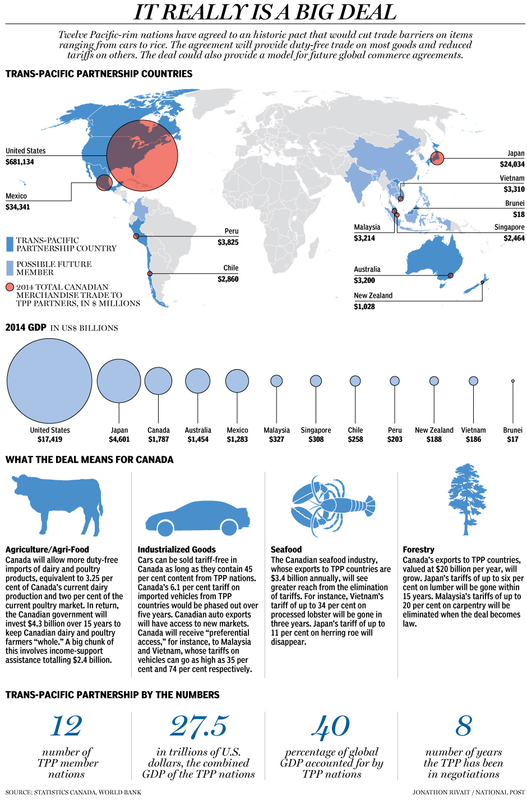 Canada is one of the world’s largest producers and exporters of softwood lumber. By value, Canada is also the world’s leading exporter of newsprint and wood pulp and the fifth-largest exporter of wood panels. Most of Canada’s wood is turned into value-added products that are sold around the world. These include coniferous lumber, plywood made of other woods, and window and door frames. The TPP Agreement will create new opportunities to further develop existing and new markets in the dynamic and growing TPP region. Tariffs imposed by certain TPP countries on forestry and value-added wood products are preventing Canadian exporters from achieving their full export potential. Japan has tariffs of up to 10 percent on forestry and value-added wood products. On forestry and value-added wood products, Vietnam applies tariffs of up to 31 percent, Malaysia of up to 40 percent, Australia and New Zealand of up to 5 percent, and Brunei of up to 20 percent. The TPP will eliminate tariffs on forestry and value-added wood products and create new opportunities in key markets such as Japan, Malaysia and Vietnam. Canada is currently the 4th-largest supplier of forestry and value-added wood products to Japan, with average annual exports of $1.7 billion from 2012 to 2014. Under the TPP Agreement, Canada’s forestry and value-added wood products industry will be able to capitalize on the business opportunities created by the growing needs of the Japanese market, including products such as lumber, oriented strand board, worked coniferous and non-coniferous wood, builders’ joinery, plywood and veneer panels. Canada’s exports in this sector will also now have an advantage over competitors outside of the TPP region (for example, the European Union, Russia and China). By generating opportunities for Canadian forestry and value-added wood products, the TPP will create advantages for Canadian businesses and workers. 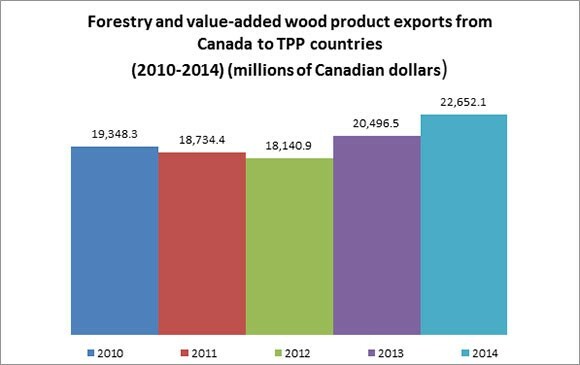 From 2012 to 2014, Canada’s exports of forestry and value-added wood products to TPP countries were worth, on average, $20.4 billion per year. In Japan, tariffs of up to 6 percent will be eliminated within 15 years. In Australia, tariffs of up to 5 percent will be eliminated upon entry into force. In Brunei, tariffs of up to 20 percent will be eliminated upon entry into force. In Japan, tariffs of up to 5 percent will be eliminated within 10 years. In Vietnam, tariffs of 5 percent will be eliminated upon entry into force. In Malaysia, tariffs of 20 percent will be eliminated upon entry into force. In Brunei, tariffs of 20 percent will be eliminated upon entry into force. In Malaysia, tariffs of up to 20 percent will be eliminated upon entry into force. In Australia, tariffs of 5 percent will be eliminated upon entry into force. In New Zealand, tariffs of 5 percent will be eliminated upon entry into force. In Vietnam, tariffs of 25 percent will be eliminated within three years. In Malaysia, tariffs of up to 10 percent will be eliminated within five years. In Vietnam, tariffs of up to 27 percent will be eliminated within three years. In Vietnam, tariffs of up to 24 percent will be eliminated within three years. In Malaysia, tariffs of up to 25 percent will be eliminated within five years. In Vietnam, tariffs of up to 25 percent will be eliminated within three years. In Malaysia, tariffs of up to 30 percent will be eliminated within five years. In Vietnam, tariffs of up to 25 percent will be eliminated upon entry into force. In Malaysia, tariffs of up to 20 percent will be eliminated within three years. In Japan, tariffs of up to 10 percent will be eliminated within 15 years. In Malaysia, tariffs of up to 40 percent will be eliminated within five years. In New Zealand, tariffs of 5 percent will be eliminated within seven years. In Japan, tariffs of up to 7.5 percent will be eliminated upon entry into force. In Japan, tariffs of up to 6 percent will be eliminated upon entry into force. The TPP contains strong provisions on non-tariff measures that will help ensure that market access gains in the forestry and wood building products sectors are not undermined by unjustified trade barriers. This will make it easier for Canadians and TPP partners to work together on the development of technical regulations and standards, and help to prevent the introduction of new technical barriers to trade, including in the areas of forestry and wood building products. The TPP also establishes a Sanitary and Phytosanitary (SPS) Committee, where SPS-related issues and concerns can be discussed by experts to facilitate trade, enhance bilateral cooperation and resolve issues at an early stage. The TPP SPS Chapter also contains provisions on regionalization, equivalence, and science and risk analysis, which is important for forestry exporters, and will help ensure that market access gains are not undermined by unjustified SPS-related trade restrictions. The TPP Agreement will give Canadian producers, processors and exporters a competitive advantage over forestry and value-added wood products exporters who are not TPP members (such as competitors in Russia, China, Indonesia, and the European Union), and create a level playing field for Canadian businesses to compete within the TPP. The TPP Agreement will ensure Canadian businesses’ continued participation in critical North American value chains and generate new opportunities in the dynamic and growing Asia-Pacific region. Imagine a mill that manufacturers and supplies pulp and paper products, including newsprint, to international markets. Under the TPP, such Canadian mills will benefit from the elimination of tariffs on pulp and paper products in several markets with which Canada does not currently have a free trade agreement. For example, tariffs on newsprint of up to 5 percent in Australia will be eliminated immediately upon entry into force, while tariffs of up to 25 percent in Vietnam will be eliminated within three years, and tariffs of up to 10 percent in Malaysia will be eliminated within five years. The enhanced market access will directly benefit these types of operations.